Devon Damp Proofing can solve all instances of damp from curing existing faults to preventing future problems. We can also design-in preventative solutions for your new build or extension project. Early action can prevent the first signs of a damp problem becoming a considerable issue that can damage the structure of your home. We will arrange a survey at a time to suit you. Visit our sister company Churston Builders for the same friendly, quality, and economical service. All building work undertaken from patios and driveways to full renovations and new builds. If you need a plasterer for a top quality finish, no job too big or too small, we can help with a full range of finishes with a tidy, courteous and timely service. 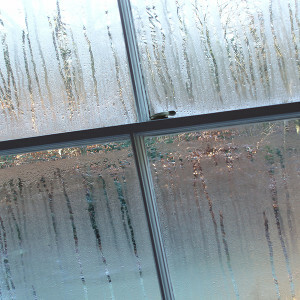 Our 10 Point Plan To Cut Condensation In Your Home Or Commercial Premises. 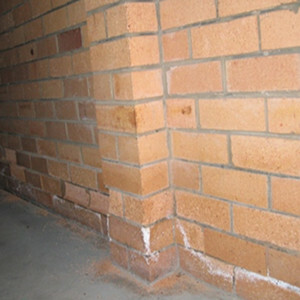 Rising Damp In Brickwork Showing As White Crystaline Salt Deposits. 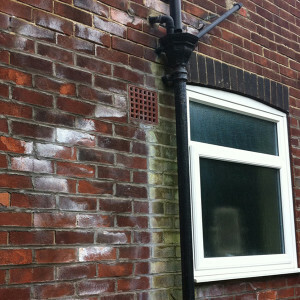 Penetrating Damp From Faulty Downpipes And Wastes.